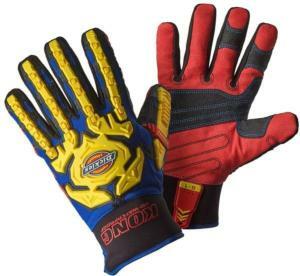 Premium quality work gloves from Dickies in collaboration with KONG - one of the world's best known glove manufacturers. These gloves meet EN388 specifications and have a feature most gloves cannot provide - they are guaranteed as oilproof & waterproof. Breathable to allow sweat to evaporate, whilst keeping your hands warm & dry. Also featuring a Duraclad rope channel reinforcement, these gloves will stand up to long periods of handling rope or cable whilst rigging for example. Finally, the protection across the metacarpal is at 80% of impact absorption, whilst the knuckle protection is at an incredible 90% impact absorption. Special Offer price while stocks last!